As our Expert Locksmith Charlotte at A-Access Lock & Key talks about below, getting your locks replaced is not only suggested, but essential for your safety and wellbeing. 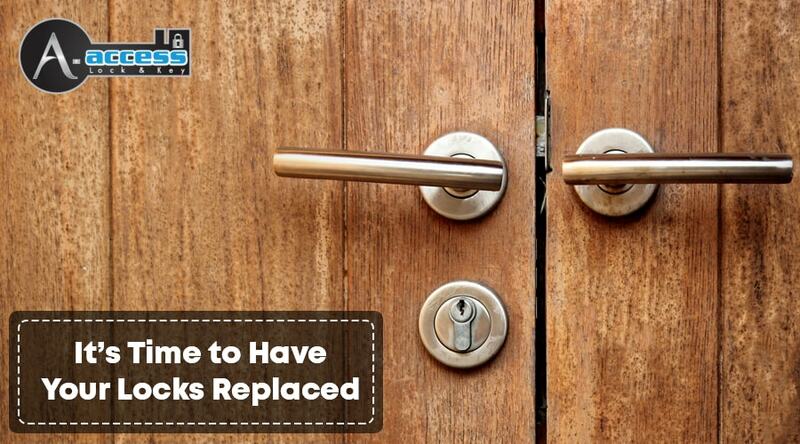 Why should you replace locks? Do you have faulty locks? Over time, your locks will eventually show signs of wear and tear. There would come a time when you have to replace them and having locks replaced should be one of the maintenance activities at home or in the office. You might find several reasons to have them replaced too. If you have any of these reasons, then don’t hesitate to call in some trusted locksmiths. This especially rings true if you have been the victim of a burglary. Get your locks replaced immediately. Although you can find how-to or do-it-yourself guides online on how to get your locks replaced, you may want to take a step back and let the experts do it for you instead. Even if you might be able to accomplish the task, there is no guarantee that you can do it right. It will not only be a waste of your time and effort to have them replaced, but a waste of your money as well. This is especially true if the new locks end up damaged after following the wrong replacement process. Moreover, there are so many types of locking mechanisms in the market today that if you don’t know enough about locks, you might end up installing the wrong one. There are also locks that are too complicated to take apart, except in the hands of an expert locksmith. If you don’t want to end up being a frustrated DIYer, it would be best to hire an expert technician. A-Access Lock & Key has the right locksmith for when you need any lock work done. Aside from hiring experienced and licensed locksmiths, A-Access also prepares an inventory full of quality locks and security systems. You can consult with our technicians and they can advise you on what brand to choose when you need your locks replaced. If you invest in high-quality locks, it would be difficult for the burglars to get in. They will also make paying for having them replaced worth it when you don’t have to replace them for a long time. This is when A-Access Lock & Key can help. Why A-Access Lock & Key for Lock Replacement? A-Access has been around for more than 20 years. Our services are all licensed, bonded, and insured for your peace of mind. We have an A+ rating from BBB and a 2013 Super Service Award from Angie’s List, among all other recognitions. We are available from 8 AM to 6 PM every Monday to Friday and 9 AM to 3 PM on Saturday. We are a Mobile Locksmith Charlotte NC, and our mobile services mean our technicians will come to you to have your locks replaced, help you on a lockout, re-key your locks, and more. Need your locks replaced? Call A-Access Lock & key. We are your local Charlotte Locksmith company you can trust. We offer a fast mobile service straight to your door. If you need A-Access Lock & Key, just call 704-545-5410. You will only need to wait for a few minutes before you will see our mobile locksmith service van coming your way. You can reach us at 704-545-5410 for lock replacement. Get your Locks Replaced with our Expert Locksmith services!